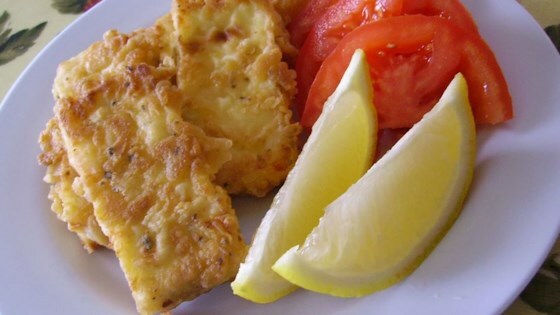 "Serve this pan-fried feta cheese with slices of ripe, red tomatoes and lemon." Slice feta into 2x3/8 inch squares, about 8 slices. In a small bowl, beat the egg with the oregano. Dip each slice of feta in egg, shake off excess, and coat in flour. Heat olive oil in a frying pan over medium heat. Quickly cook cheese in olive oil until golden, turning once. Pat dry with paper towels. Arrange feta on a plate with thick tomato slices, season with black pepper, and garnish with lemon wedges. Watch Chef John set fire to this crowd-pleasing fried cheese.